This post is the second in a series with tips on writing the Ph.D. thesis. In the first post, I shared tips for preparing to write the thesis, which can make the entire writing process a lot smoother and very rewarding. 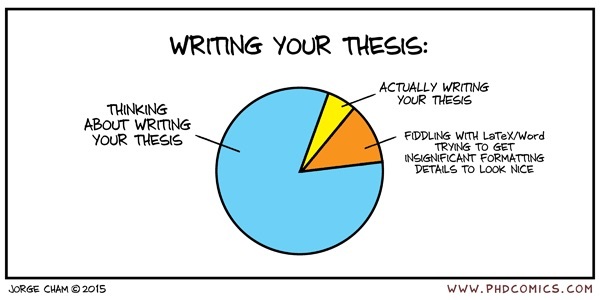 In this second post, I focus on tips related to getting started writing the thesis. “Getting Started” will here be understood in two ways; getting started writing the thesis at all, and getting started writing the next chapter, and the next chapter, and so forth. As explained in the first post, my own Ph.D. thesis was written in the form of a monograph, consisting of a total of ten chapters, and having a strategy for attacking each new chapter made the writing much easier. Part of this post is inspired by an earlier blog post (in Danish). Also, The Thesis Whisperer was inspirational during my thesis writing. Getting started writing the Ph.D. thesis – or any other long document – relies crucially on one thing: Gaining writing momentum. Until you gain this momentum, results, ideas, and thoughts will stay in your head and not become part of the thesis, so gaining writing momentum as early as possible in the writing process is important. Most of the following tips revolve around the idea of removing obstacles that impede the process of building writing momentum. Being conscious of the small things that interfere with and slow down your writing makes it easier to form habits that will help to start writing. A first thing to decide is what to start writing. If you have prepared the writing well – for example with a mindmap and a draft for the table of contents – you should have a good overview of your options for what you could start writing. First of all, start with a chapter that will be easy to write. For sure, the introductory chapter is not easy to write, as you need to motivate the entire project and introduce your thesis – that you haven’t written when you first start writing. Similarly, chapters on work that is still in progress may be difficult to start with; such chapters will possibly have loose ends, and their contents could change substantially in the course of the thesis writing. Other chapters, in turn, will be based on work that is more finished when you start writing. Results, analysis, and interpretations are finished, and these might already be published. Such a chapter is easier to start writing, as you just need to present the work that you have already done. I started my thesis writing with chapter nine that is based on the first two journal papers I published during the Ph.D. This was interesting work that, however, was no longer in progress when I started writing, and except for one additional point I wanted to make, I built the chapter around figures and analysis from the two papers. #PhD supervisor tip before starting to write #PhDThesis: "Start with the easy parts that are finished and nicely wrapped up (: published)". Once you have decided which chapter to start with, you need to figure out where to start writing. Here, you can basically use the same logic as presented above: Start with the easy parts, like insertion of figures, method description, and description of results. These are all, more or less, mechanical to write. Later, when you’ve used these initial parts to gain writing momentum, you get to the more difficult parts, like interpreting the results and putting the work into perspective (introduction, literature survey). Start writing as the first thing in the morning. Make sure you have a plan of what to start writing when you leave the day before, and then just write. The worst thing you can do, when the goal is to build writing momentum, is to hesitate and start doing other things. If you don’t start writing right from the beginning of the day, you easily spend an entire day thinking about writing, before you eventually get a bit of writing done – which is mentally taxing. It is better and more satisfying to write in the morning and then potentially do other things in the afternoon. That way, once you get to lunch, you’ll have a good feeling about the writing progress you have already made. Just write and don’t worry too much about the quality of your writing. Then, when you’ve finished writing a paragraph or a section, read and edit it. Then move on to the next paragraph or section, write, and then edit. A killer in the process of building writing momentum is the fear of the writing not being perfect. It will never be perfect, and if you worry about it, you won’t get anything written. It is easier to edit an already existing text into a better text than to write, on the first attempt, the perfect text. Write in sprints where for a set amount of time (for example half an hour or an hour) you only write and edit the text. Then take a short break where you leave your writing spot and possibly get some fresh air, a fresh cup of coffee, or a small bite. The break is a small reward at the end of finishing a writing sprint, which makes the writing more bearable. This approach to thesis writing is inspired by the Pomodoro Technique. And while I don’t in general use this technique, I found that it worked very well during thesis writing. I didn’t fix a time for the sprints, but allowed myself the small break whenever I had finished something substantial (typically a paragraph or a section). It is easy to get distracted during thesis writing, and removing sources of distraction is thus essential. A big source of distractions is e-mail that you should close during writing. It is very unlikely that you will receive e-mails of importance for your writing, so there is basically no excuse to not close it. During thesis writing, I closed both my work and private e-mails. I then sometimes used the short breaks to check e-mail on my phone, which also made it easier to leave them closed on the computer where I was writing. If you have published papers or conference contributions on the topic of the chapter you are about to start writing, then re-read and summarize these before starting to write. I did this and summarized each of my papers into “Motivation”, “Methods”, and “Results” sections, which made writing the associated chapters more straightforward. In the course of your Ph.D. project, you have hopefully collected and read a lot of literature that is relevant to your own research. At the time of writing the thesis, it is useful to read and re-read literature to be able to choose your own angle and to position your own work relative to previous results. This reading is important, for example to write literature surveys, but should be done in moderation; there is a lot of literature you could read, but not all of it will be very relevant to your thesis. And remember: The goal in this initial phase is to build writing (not reading) momentum.